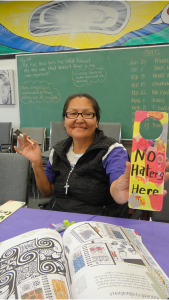 She’s now a regular guest at The Door Is Open and attends our Women’s Wednesday program where we aim to provide a safe and friendly space for women to drop in and socialize over breakfast, arts & crafts, and lunch. 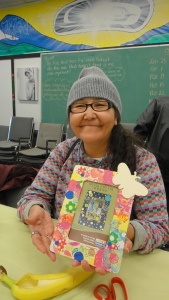 She is living in a single-room-occupancy hotel (SRO) close to The Door Is Open and is looking for a permanent home. Myrtle also likes to cook and bake and misses having cooking facilities. 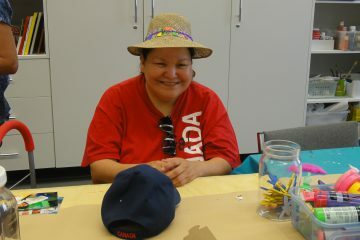 She enjoys visiting the housebound residents of the Downtown Eastside (DTES), often taking food and clothing from The Door Is Open and other centres to them, as well as attending bingo games at drop-in centres in the area. Myrtle is a member of the Grouse Clan. Her great-great-aunt wrote a book called “Stoney Creek Woman” (Saik’uz Woman) about growing up in Central BC on the Stoney Creek Reserve. 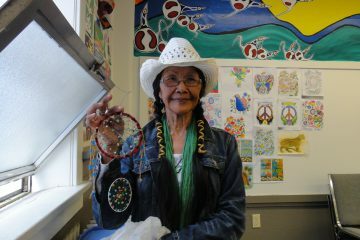 Myrtle’s artwork at The Door Is Open Women’s Wednesdays often displays her pride in her heritage, or features the names of her sons. Her eyes light up whenever she speaks of her four beloved sons, all of whom are going to school or working. 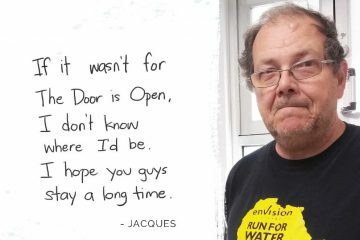 On Wednesdays at The Door Is Open, we aim to provide a safe and friendly space for women to drop in and socialize over breakfast, arts & crafts, and lunch. 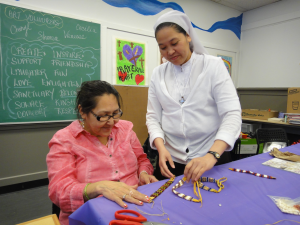 Myrtle says that she particularly finds arts & crafts relaxing, and enjoys “everything (we) do” at these Women’s Wednesdays. With your help as generous donors and volunteers, our cost for serving one guest is only $3.88 per day. Would you consider giving to help others like Myrtle?